When travelling locally or overseas, we always choose airbnb accommodation over hotels - and there was no exception to the rule when tommie took a month long trip to the U.S.A earlier in the year. We stayed in the wonderful home of creative duo Emily Katz, macrame artist and Adam Porterfield, screen printer. Based in North East Portland, their home is a modern bohemian dream. Decorated with pieces from locally made artists and designers, the couple support handmade, independent art and craft - from hand dyed pillow cases, Emily's own macrame hanging across the walls, handmade soaps and bed designed by a local artist; they are the real deal when it comes to the 'buzz terms' of #shoplocal #shopsmall and #supportsmallbusiness. Along with independently crafted interiors, the house is filled with lush greenery every direction you look - a common theme we discovered in the city of Portland! The duo are advocates for a zero waste lifestyle - their pantry was filled with very minimal, if any plastic packaged items, and they are experts when it comes to BYO reusable shopping bags, with a pile planted on the floor of their walk in pantry, just waiting for their next shopping trip! With a kitchen composting and recycling system, they get the green tick of approval by us! With two bicycles just outside their front door, Emily and Adam are perfect examples of how to lead a sustainable life - and this is who we want to support. You vote with your dollar every time you engage in a transaction, so why not support the people who are making a difference and going to great lengths to challenge the status quo and live a more 'green' and 'eco' life. Hotels use more energy, water and the majority of their complimentary items are packaged in plastic. By choosing to stay at an airbnb home, you're proactively choosing to say no to this. Within walking distance to popular Alberta St, the number 6 bus and a local bicycle joint, you have eco transport at your fingertips without having to hire a car for your stay. Add Portland to your 'cities to visit' list and make your sure to book in your stay with the Wood Box Guest House. Details below. 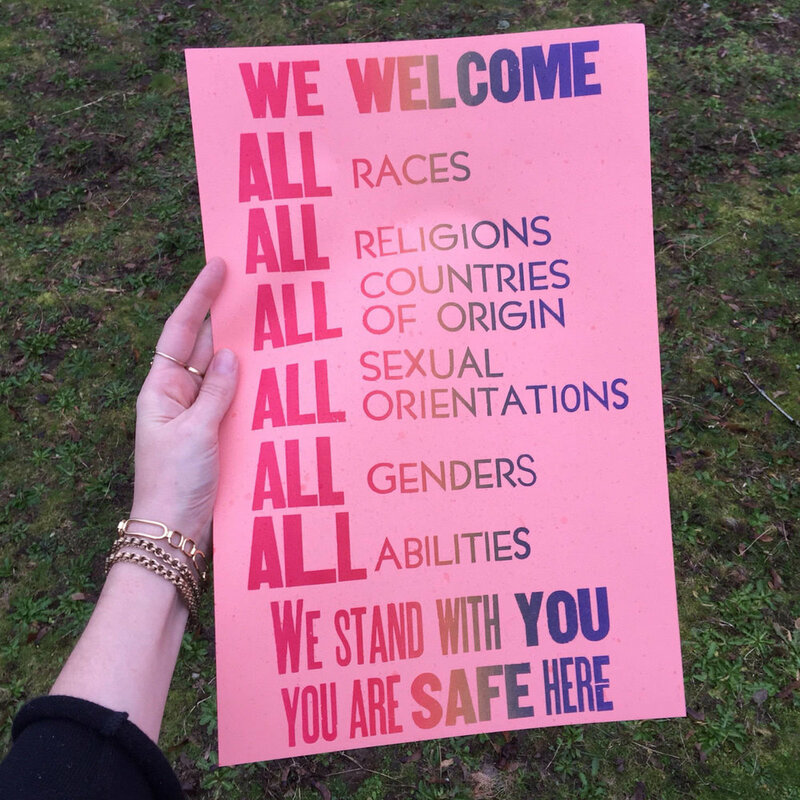 The City of Portland shared their political and social views on the front yards of their home, on shop fronts and on the streets. The public activism was in high swing when we visited in March this year, not long after the recent Presidential election. There's no denying that the people of Portland are very creative - take a walk along popular Alberta Street to see the numerous walls of street art! We're suckers for the colour pink here at tommie, so we hunted down some of the best vintage stores with pink interiors and exteriors! For all those who share the same love for the colour pink, you won't be disappointed with these finds! When it comes to food and beverage, the city of Portland very much support locally grown produce and use quality and organic ingredients as much as possible. Here are our favourites that you must visit! 1. Salt & Straw Ice Cream: we visited the 2035 NE Alberta St, Portland location. The flavours were amazing and we especially loved this ice creamery as they are all about community, as well as sustainability - when trying ice cream flavours you're given sterling silver dessert spoons, instead of plastic, which you then place in a bin chute when you're done! 2. Kruger's Farm Market: we visited the 2310 SE Hawthorne Blvd, Portland location. We love that the raspberries, blueberries and strawberries were packaged in cardboard instead of plastic! 3. Case Study Coffee Roasters: Do yourself a favour and visit this cafe, you won't be disappointed. The coffee and the interiors are perfection - if you're choosing to take away don't forget to bring your reusable coffee cup with you! We visited the 1422 NE Alberta St, Portland location. 4. Blue Star Donuts: Made by hand every morning using free range eggs and certified sustainable bread flour - there's a reason these donuts sell out before 11am very morning - get in early to avoid disappointment! We visited the 3549 SE Hawthorne Blvd, Portland location. We tried the following flavours: Cinnamon sugar, Passion fruit Cocoa nib, CremeBrûlée and Chocolate ganache. 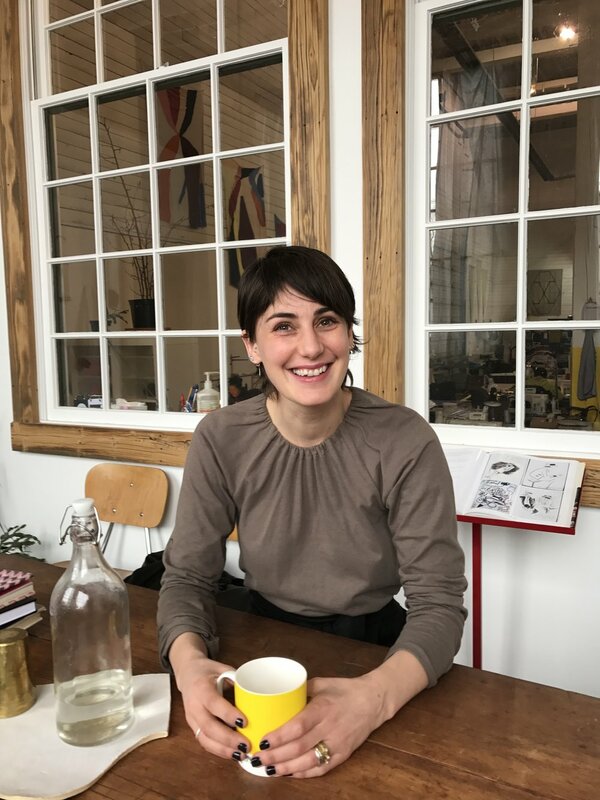 Earlier this year we had the privilege of meeting Britt Howard, female entrepreneur, founder and owner of Portland Garment Factory - a full services design and soft goods manufacturing studio. I [Natalie Shehata] met with Britt at the PGF HQ in south east Portland on a rainy Friday morning; we walked around the corner to a local coffee shop - Britt with her BYO coffee mug in tow - followed by an hour long chat in the meeting area of PGF and a tour of the space, before she had to leave for an interview with the Portland Business Journal about her 'WOMEN OF INFLUENCE' award she received earlier in the year. The Portland Garment factory is a key example of keeping production and manufacturing local and utilising the skills of those in the local community - you really know 'Who Made my Clothes' in this factory as everything is done in-house! When you walk into the factory you can't help but notice the very large, colourful fabric draped across the wall. When I chatted to Britt she explained that these served as the factories values. 1. RESPECT TIME: An hourglass shape, a reminder of the importance of time & pace. 2. THINK FORWARD: A road leading to many paths with infinite ideas ahead. 3. HONOR PROCESS: It bends and winds before it ends, each step with a clear purpose. 4. INVITE CHALLENGE: Stacking of forms, recall climbing a great peak. The visual values sit on the wall above the PGF sewers and were made out of left over fabric scrap. Britt mentioned that is was important the values were a collaborative decision by all members of PGF, so she hired translators for the non english speaking sewers, so that everyone had access to the decision making process and were determined by all staff. When speaking with Britt you very quickly learn how important the issues of diversity, equality, feminism, sustainability and a zero waste life are to her both, professionally and personally. Britt is the recipient of many awards, including a Silver Certification for Sustainability at Work by the city of Portland. We came across this amazing vintage store on SE Hawthorne Boulevard! With colour blocking in the window and on the racks, a rack full of denim and polaroids of cats on the counter - these ladies won our heart! Excellent condition vintage pieces curated and styled with a modern, designer edge. Be sure to check this store out! We have followed this wonderful little store over on Instagram for quite some time, and were thrilled to be able to visit in person and meet store owner and curator, Lisa Mangum. We chatted about our similar views on politics and society in general and our shared love for community and vintage fashion and accessories. Not only does Lisa source and sell unique, one of a kind vintage pieces from her travels around the world, but she's the leader of a movement that's happening all across America right now. 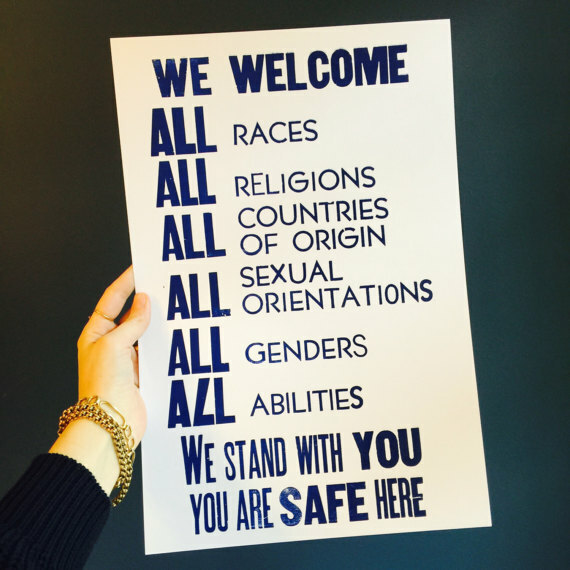 A few days after the U.S political election this year, Lisa, her husband and daughter letter pressed the infamous 'WE WELCOME' signs by hand for their own shops and for others to post around the city of Portland. Now demand is so high across the country that they are offset printed and you can now order your very own here! Lisa explains her motivations for starting this; "we see this as an act of solidarity with our communities and a stand against this administration's agenda to silence, target and vilify the most vulnerable among us". tommie spotted the posters plastered across L.A, San Francisco and Portland in cafe windows, restaurant windows, clothing stores, in ice cream parlours and everything in between. Be sure to check out OKO Portland when you are visiting North East Portland. The Red Fox Vintage stores located in both Killingsworth and Woodstock are both worth a visit. The Woodstock store is much larger with compartmentalised spaces from vintage vendors ranging from clothing to homewares. A must add to the list with reasonable prices - a great place for a rummage! We're calling it, this has to be our favourite vintage store in Portland - not only for it's very, very affordable prices, but also because it is full of amazing pieces from various eras and decades. There's something for everyone as this store is a treasure chest for your next favourite vintage piece. You could literally spend half a day in this store, so if you're the real deal when it comes to a good old rummage, make sure to allow yourself plenty of time for a thorough look. We'll happily admit that we arrived when it was daylight and left when it was dark! We visited and got so excited that we forgot to take photos. Woops! Here are some of our favourite finds from the day though, which are all available over at the tommie shop! 13. OTHER FAVOURITES TO VISIT! 1. HOUSE OF VINTAGE - 3315 SE Hawthorne Blvd, Portland - This place is huge, so much so that we forgot to take photos because we had our hands FULL with clothes. You could spend hours in here as there's just so much on the racks - some really great finds if you look hard enough, but you really do need to go digging. The store was very busy when we visited, which means you do need to wait for change rooms. If you've got the time, get yourself a shopping trolley to take with you so that you can place all your items in there as you'll need your arm strength to battle with the full racks. I'm not kidding - and pack a banana or two! 2. POWELLS BOOK STORE - 1005 W Burnside St, Portland - This one's for the book worms, the avid readers. This place is HUGE! You really don't know where to look first! We visited on a rainy night, and it really is the perfect way to spend an evening when the weather is wet. There's even a cafe inside to cater to your warm beverage needs - so make sure to take your reusable coffee cup along for the ride! The aisles are long and the shelves are tall - the bookstore houses over one million books and is the largest used and new bookstore in the world! 3. PALACE STORE - 2205 E Burnside St, Portland - A beautifully eccentric, curated store featuring vintage clothing, homewares, decor, beauty & body care items. Lots of colour and cute details throughout! Be sure to visit this one ladies, you won't leave empty handed! 4. GOOD WILL STORE - 1943 SE 6th Ave, Portland - Now this is an op shop - or as they like to call them in the U.S.A - a thrift store. My goodness me this was huge, rack after rack of clothes. If you're like me and you only like to find vintage at op shops I was fresh out of luck. But if you're not as fussy as me, and you're after a bargain - then this is the place. My personal favourite was actually the camera and electronics section - loads of vintage cameras and accessories, so if you know your stuff when it comes to valuable vintage pieces, you're bound to find a collectors piece in the homewares section. We stayed here until close which I think was until 8 or 9pm! 5. HATTIE'S VINTAGE - 729 E Burnside St # 101, Portland - Expertly curated, a true vintage collector. This boutique has rare and excellent condition pieces for your more formal or casual needs. The owner, Hattie is so polite and helpful - if you're a true vintage lover like me you will appreciate her eye for detail and how clean and organised the store is!